The Philadelphia Student Union runs citywide campaigns that bring together students from all of our chapters and additional schools to improve school district policies and practices. The Campaign for Nonviolent Schools (CNS) was created by members of the Philadelphia Student Union who were working on improving the climates in their schools. Chapter members at Overbrook High School fought and won the end to a punitive late room policy, students at Sayre won the right to train their school police officers, and students at West fought for, won, and experienced the transformative power of restorative practices. In November 2010 we held a Youth Power Summit that brought together over 240 high school students from around the city to talk about ways to improve our schools. Out of this Summit the base of the CNS platform was developed. In August 2012, after a time of struggle and persistent work, we won significant changes to the code of conduct- seeing the policy change to reduce exclusionary discipline practices and make a move to focus on prevention. 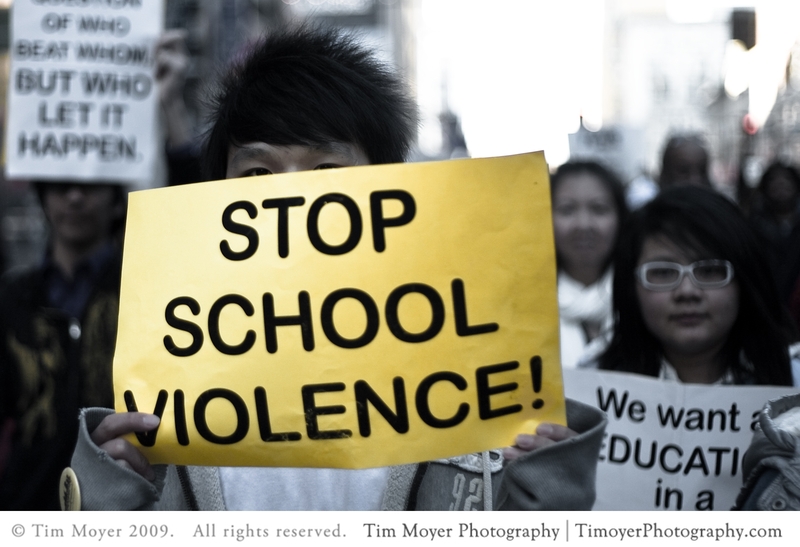 CNS is now a fully realized youth-led effort dedicated to addressing the root causes of school violence without pushing young people into the criminal justice or deportation systems. The Campaign is built on a strong foundation of student-led organizing to improve school climate, create pro-student discipline policies, enhance trust and communication between students and school staff, and bring equity in human and material resources to all schools. Current Issues Prison-like school environments, a lack of resources, high staff turnover rates, and suppression of youth leadership are examples of conditions that enhance feelings of anger, frustration, and helplessness that young people may already be struggling with. These conditions help to create school environments which are a breeding ground for physical and emotional violence directed at other students and staff members. We are continuing ongoing work to end the school-to-prison pipeline. Specifically we’re trying to end an over-reliance on exclusionary discipline practices (like suspensions and expulsions) and get the District to focus more on prevention measures like restorative practices. In 2001 PSU played leading role in limiting efforts to hand over the School District of Philadelphia to the for-profit Edison Learning (formerly Edison Schools) and other providers. Our efforts in collaboration with others, which included takeovers of the Mayor’s office and the school district building, resulted in stopping the privatization of the central administration and any high schools, gaining a second mayoral appointee on the School Reform Commission, and limiting the overall number of schools turned over to for-profit companies. In March 2012, in response to private donors and foundations hiring the Boston Consulting Group (BCG) to create a restructuring plan for the School District, the Philadelphia Student Union joined with Youth United for Change, Action United, Philadelphia Federation of Teachers, and over a dozen other community, parent, labor and education activist groups to form the Philadelphia Coalition Advocating for Public Schools. In late April Chief Recovery Officer Thomas Knudsen announced that under the recommendation of the BCG he was submitting a proposal to the SRC to dissolve the central administration, close 64 schools and privatize many school services. As apart of PCAPS members of the Philadelphia Student Union led protests at three community meetings held by the School Reform Commission demanding the plan be scrapped. These protests were part of a citywide chorus demanding that the BCG’s plan be scrapped in favor of a plan created by students, parents, teachers, school administrators and community members. In April 2012 the Philadelphia School District announced a plan created by the BCG as the solution to a crippling budget deficit. The plan calls for the closing of up to 64 schools (coinciding with the Facilities Master Plan that was announced prior to BCG’s plan), disolvving teh central administraion, break the district up into “Achievement Networks,” and place up to 40% of the students in charter schools. In May 2012, at the scheduled vote on the Boston Consulting Groups plan, the SRC delayed its vote in response to massive community disapproval of the plan. On Friday Jan. 4th, 2013 the Superintendent announced to PCAPS that the SDP is no longer working with BCG or considering their recommendations. Dr. Hite’s recently announced plan to the guide the school district, while lacking does not include the main tenets of the BCG plan. In September 2012 PSU co-founded Journey For Justice (J4J) a national coalition of youth organizing and community groups calling for a national moratorium on school closings. On Sept. 20th, 2012 J4J met with the National Department of Education, Congressional Black Caucus and the Office of Civil Rights. The Office of Civil Rights is investigating the possible Civil Rights Violations caused by widespread school closings. DOE committed to doing an impact tour of cities experiencing school closings. Read March 2013 update on school closings.